Sitting Frogs S&P Shakers | MWAH! S&P Shakers Figurines | One Price Low Flat Shipping! 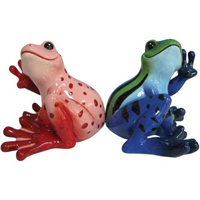 This Peace Frogs magnetic salt and pepper shaker set features a pink with red spots frog and a blue/green with black spots frog sitting back to back.